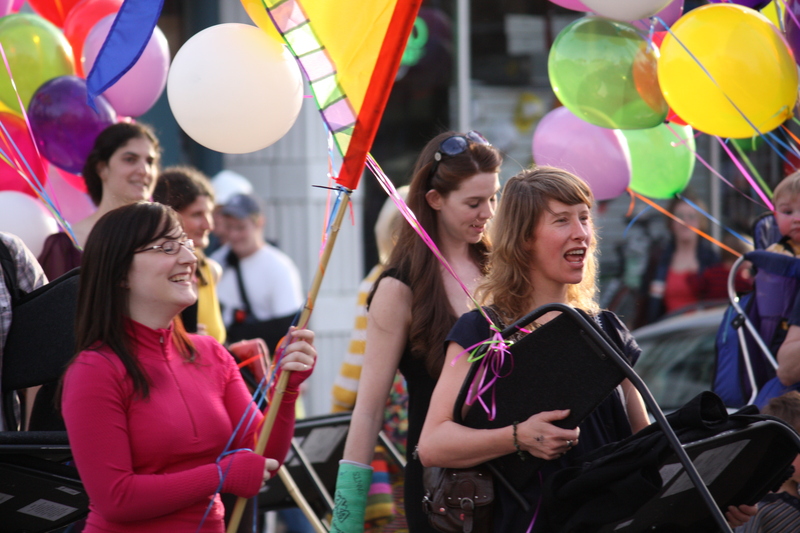 We’ll have more from Saturday night’s celebration for Velocity Dance Center’s move to their new home on 12th Ave but here are some images and sounds from the parade portion of the festivities. “If anybody has any question about what makes Capitol Hill special you can see it right here,” Mayor Mike McGinn said before cutting the ribbon to help open the new facility. You can see the rest of his speech (and hear some of it too! Sorry for the bad audio!) below along with some pictures from the parade route. If you’re wondering why some people — including the mayor — are carrying furniture, the parade was more than a celebration — it was also the last step in the process to move all of Velocity’s stuff out of the Odd Fellows building. UPDATE: If you were in the vicinity of Odd Fellows and 12th Avenue Saturday around 6 PM, you probably witnessed a colorful procession of people marching and dancing through the streets in celebration of Velocity Dance Center’s Greatest Move on Earth. This victory parade marked Velocity’s focused, sustained commitment to secure a long-term, affordable space where dancers, teachers, and supporters can enjoy the art of dance. The event attracted attention as the marching band and costumed individuals led a crowd of adults and children from the street in front of Odd Fellows on East Pike and 10th Avenue, up three blocks to Velocity’s new home at 1621 12th Avenue. 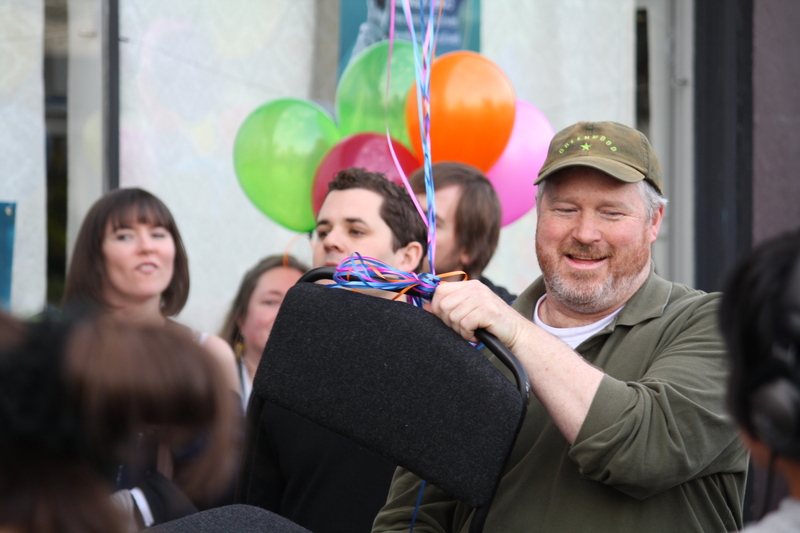 Mayor Mike McGinn gave a short speech and then the crowd poured into the new space consisting of a roomy entryway and three dance rooms. Inside, another series of thank you speeches commenced, followed by a night of breaking in Velocity’s shiny new dance floors. Now that Velocity has officially settled into its new home, they’re keeping things active by beginning with a week of free, public dance classes from March 28 to April 3. A list of classes is available on Velocity’s website. Also, mark your calendars for April 18, the date of Velocity’s Annual Bash, a fundraising event that will have a Mad Men theme. Also of note — signs for a new sushi restaurant set to move into the former home of Crave. More details on that soon.